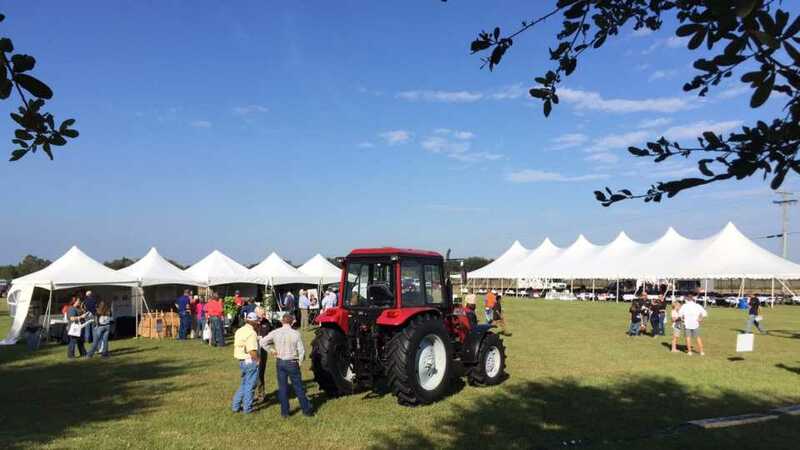 A sunny, breezy, balmy morning greeted visitors as they filtered into the 2016 Florida Ag Expo outdoor display area. What does the ‘Tasti-Lee’ tomato and the ‘Sweet Sensation‘ strawberry have in common? Perhaps you’re not quite sure. Here’s another clue: Add to those noteworthy accomplishments a copious amount of cutting-edge research being conducted to bring a Florida-grown artichoke and/or a craft beer featuring locally grown hops to market. The answer? These recent successes and present-day initiatives and more all are the work spearheaded by UF/IFAS researchers — in particular, the team based at the Gulf Coast Research and Education Center, the location of the 2016 Florida Ag ExpoSM held last week. Hundreds of growers and industry-related stakeholders gathered at the research facility in Balm for the 11th running of the event presented by Florida Grower® magazine and UF/IFAS in cooperation with the Florida Fruit & Vegetable Association, Florida Tomato Committee, and Florida Strawberry Growers Association. The one-day gathering featured a full educational session agenda, hands-on pest and disease identification workshops, field tours, and a sprawling tradeshow. Though counting as separate pieces of the Expo, all of those elements were connected by a common thread: science. The progression of research being done and carried out to enhance varieties, production practices, technology and automation, as well as the chemistries for crop protection, is truly something to marvel. Jack Payne, Senior VP of UF/IFAS, is particularly proud of his team, and he expressed that sentiment during his welcome address. He made note of recent and still-to-come breakthroughs in blueberries, worthwhile investments in greenhouse structures to take strawberries to a new level, the quest for a disease-resistant tomato, and the endeavors already in motion to find a viable alternative crop in hops, artichokes, and more. Scan the photo gallery above for a comprehensive compilation of images captured and information gathered during the 2016 Florida Ag Expo.